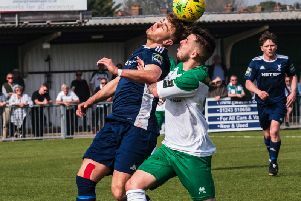 Burgess Hill Town manager Ian Chapman says he is ‘really pleased’ with the signings the club have made so far this summer and feels they will help them improve on a disappointing season. After another tough season, the Hillians narrowly survived on the final day, and Chapman has since brought in Ben Pope from fellow Bostik Premier side Worthing, secured the permanent signing of Connor Tighe from Whitehawk, and has most recently acquired Tom Cadman from Brighton and Hove Albion. Chapman said: “The way it’s going at the moment, we’re really pleased. “We’ve still got to bring some more in but I’m pleased with the signings we’ve got. It’s coming together nicely. “It’s always a hard time of year, because clubs speak to players and players are obviously going to take the best offer they can get." Pat Harding took home three awards at the club’s annual presentation night. Harding won Supporters’ Player Of The Season, Player’s Player Of The Season and received the John Buck’ Special Achievement Award after he scored his 100th goal for the club. Charlie Bennett won Young Player Of The Season while James Richmond won Manager’s Player Of The Season. Supporters’ Player Of The Season - Pat Harding. Club Volunteer Of The Year - Tim Spencer. U18s’ Player Of The Season - Mitch Bromage. Player’s Player Of The Season - Pat Harding. U23s’ Player Of The Season - Tariq Richards. Chairman’s Young Player Of The Season - Charlie Bennett. John Buck’ Special Achievement Award - Pat Harding (100 Goals). Manager’s Player Of The Season - James Richmond. July 7 – East Grinstead Town (a) – 3pm. July 14 – Horsham (h) – 7:30pm. July 24 – Eastbourne Borough (a) – 7:45pm. July 28 – Haywards Heath Town (h) – 3pm. August 4 – Harrow Borough (a) – 1pm.